Years ago I was in an exhaust shop. On the floor was a project that while using exhaust tubing, was certainly no exhaust. Instead it was a sand drag racing motorcycle, powered by a Nissan V6. It wasn’t the engine that attracted my attention but the design of the frame. In a word, it was terrible. There was little triangulation, lots of bending loads, little cross-bracing. I bet that on the sand it deflected a heap... Then, more recently, I was in another workshop, this one building expensive replica cars. 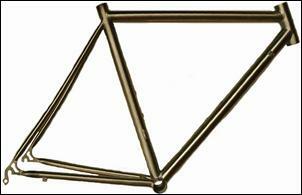 I looked really closely at the tubular frame, and saw some things I simply couldn’t believe. Like porous welds, sheet metal braces that didn’t quite fit, and worse of all, suspension mounts whose locations had clearly been decided after the space frame had been designed and built. How could I tell the latter? It was dead easy – the suspension mounts simply weren’t at the strongest parts of the chassis! Both these examples are of full vehicles, but good engineering of structures plays a part right down to the smallest bracket that you might make to hold something in the engine bay. So, without taking an engineering degree, how do you stop things bending and breaking – especially if you also want to keep them light? First up – and this is a very important point – the materials that you’re using don’t matter all that much to the design. Sure, if you have material that’s super strong, you can get away with using less of it, but the absolute basics of structural design hold true for any material that you might use. It’s the same as the design of buildings – arches (which, incidentally, are very strong) can be made from plywood, steel, fibreglass, timber, or even stone. The shape is strong, irrespective of what it’s made from. So don’t get carried away if you’re using something that’s especially strong like titanium – and by the same token, if you’re using humble aluminium, good design principles hold true as much as ever. ‘Action’? What action? Well, whenever the components within a structure (whether it’s a full custom tubular chassis or a simple battery tray support) are subjected to forces, the forces can be broken down into just three categories. Knowing these categories is very important – it’s the toolkit that lets you envisage what’s going on. Imagine you have a wooden plank supported on two piles of bricks, one pile at each end. You stand on the middle of the plank and it bends under your weight. Simple, huh? It is, but it’s also important to know that materials are also weakest when subjected to bending forces, so bending – so common in many structures – should be avoided wherever possible. An example of inappropriate bracket design resulting in bending can be seen here. The engine is trying to bend the brackets downwards, not only with its weight but also with the twisting forces that come into play when the clutch is dumped. Not good. I don’t want to sound too much like the teacher (I once was), but look at the diagram and think of how you could configure the brackets so they’re no longer subject to bending loads. Most materials are weak in bending - but most are strong in compression. Think of that wooden plank again. It’s supported by some bricks, which are being subjected to compression because of your weight. The bricks aren’t going to crumble into dust – they’re strong in compression. In fact, if instead the plank was supported on some wooden struts (concreted into the ground so they can’t fall over), experience tells us you could go pretty bloody thin with your struts before they failed in compression. Most car engine mounts use material that’s in compression. Oftentimes that’s because rubber blocks (or in more recent cars, fluid-filled mounts) are used and they work best in compression. 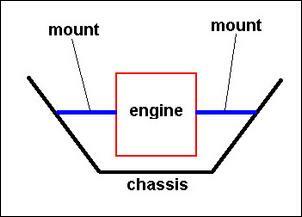 But also simply because of the forces that are being dealt with, material in compression provides most of the answers for engine mounts. And if stuff is strong in compression, it’s often even stronger in tension. Take that wooden plank – yep, again. This time suspend it from some thin wires - the wires are in tension. Even more so than in compression (and much more so than in bending), those wires can be very thin while still being able to support your weight. In fact, the supports could be made from thin fencing wire and still work without problems. But try to use the same material in bending and the wire would immediately flex downwards...and the plank fall down. Try to use the same wire in compression and the wire would immediately buckle... and the plank would again fall down! Bending, compression and tension are the obvious ones – but torsion is trickier. 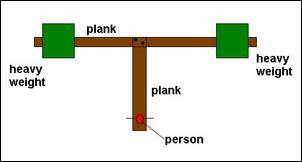 We’ll use the plank example again. This time, though, we’ll anchor both ends to the pile of bricks, say by putting a half-tonne block of steel on top of the plank at each end. (In this diagram the view is from above.) OK, so the plank isn’t going to move (and the bricks are still fine even under this enormous compression – think of how they survive with a car sitting on top of them). We’ll then get another plank and attach it at right-angles to the first plank, so its full length is hanging out sideways. It’s supported by the first plank, but if you try to walk out on it, it will strongly attempt to twist the first plank. The first plank is said to be in torsion – it is being twisted. (It’s also being subjected to simultaneous bending loads – failure, here we come!). Torsion bar springs are the most familiar examples of torsion, but in fact all coil springs are also subjected to torsional strain. Indeed, many structural members are subjected to torsion – it’s something to look out for because it may not be immediately obvious. That’s very nearly enough for this week, but let’s take a look at an example. So what happens to these forces within the arm? The upper arm is in compression, the arm leading to the suspension bush is in tension, and the gusset panel is in tension. (Remember how most materials are strong in tension? That’s why the gusset panel is made from only thin sheet.) But what’s happening to the member at far right, the one which bears down on the coil spring? The bottom of the spring actuating lever is in tension, while the top is in compression. In other words, yep, this baby is subjected to our old foe – bending. In fact, it’s the only part of the arm subjected to primarily this type of action. 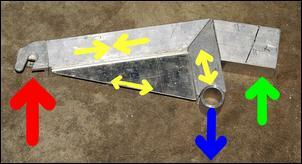 However, to compensate for its larger bending loads, a deeper rectangular tube has been used.